The Weeping Window display has been on a tour of England after the fantastic display at the Tower of London. They arrived at Carlisle Castle in June 2018 and I just had to get there while the sun was shining in Cumbria! 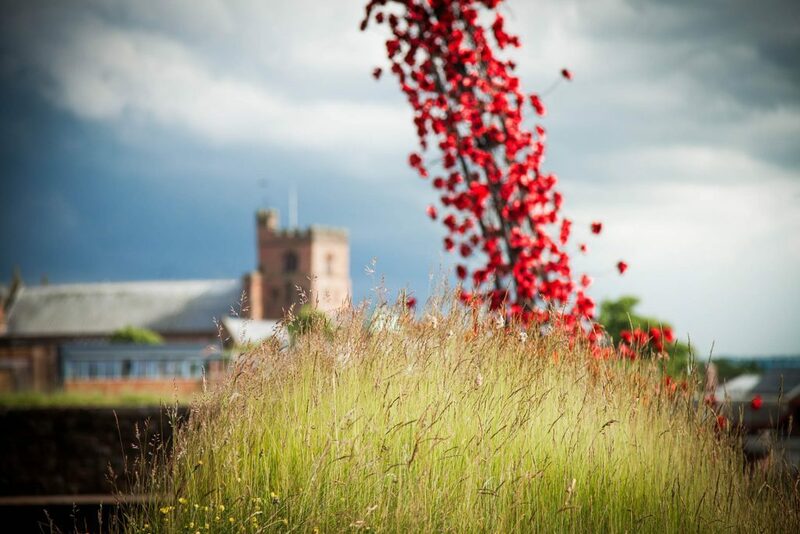 The idea for this shot was to show that the poppies were in Carlisle without showing the castle itself. Fortunately this viewpoint allowed the photograph to feature Carlisle’s medieval cathedral in the background. It may not be as grand or as striking as other cathedrals such as York Minster or Lincoln, but people from Carlisle would instantly recognise it. The focus on the grass was purposefully done to take the attention off the poppies in order to create a dreamy look, to remember those that they represent. Using a medium aperture, f/4 and standing several metres back, combined with a 105mm focal length, allowed me to create this soft focus effect on the poppies and the cathedral and compress the perspective. Getting there at the right time of day was important too. Knowing that the poppies were facing the west, I would either need to get there early morning so they were fully in the shade or in the afternoon form 4pm by which time the sun had come round sufficiently so that it was casting contrasty shadows from the myriad poppies on display.